“The greenest building is the one that’s already built” said architect Carl Elefante. It’s also true that the greenest foundation is the one you’ve got – even if it’s tilted, bowed, or bulging! When confronted with a foundation that is under stress or that has severe settlement problems, many contractors recommend jacking up the house, removing the old foundation, and installing a new one. As you can imagine, the job is messy, disruptive, and expensive. What may not occur to you, however, is that it’s not very green either. That’s because your existing foundation contains a great deal of embodied energy, or the energy required to produce it. Concrete, largely due to the energy needed to produce Portland cement, has more embodied energy than most building products. In fact, the embodied energy in a typical 30- x 30-foot foundation (roughly 40 cubic yards of concrete) could fuel the average US home for more than a year. These numbers do not even include the energy it would take to demolish, remove and dispose of the old foundation. Building a new foundation will also contribute about 10 tons of carbon to the atmosphere. Add it all together, and you can make a strong case for preserving the foundation you have. 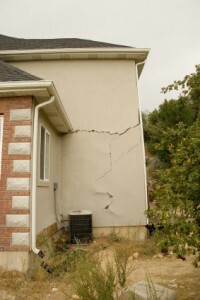 There are minimally disruptive ways to save a cracked, bowed, or even buckled foundation and to avoid the nightmare scenario of having to replace a foundation. Foundation Supportworks, Inc. (FSI), a national network of foundation repair specialists, has developed products and techniques that include carbon fiber straps, I-beams, piers, and soil-stabilizing polyurethane foam. None require excavation, cribbing, heavy equipment, lifting your house off its foundation, or destroying your landscaping. Foundation walls may be reinforced in several ways. Carbon fiber straps, embedded in epoxy, is the least costly approach. The straps, which have a tensile strength that approaches that of steel, will stabilize a cracked or slightly bowed wall but will not straighten the wall. For that, I-beams and joist brackets may be used. Over time pressure may be applied to the I-beams by turning large screws in the brackets. Gradually, the wall may be pushed back to its original vertical position. Either solution can be completed in one or two days without any excavation or disturbance to your home or landscaping. If foundation walls have bowed more severely, or begun to buckle, FSI often recommends its wall anchor system. It uses helical anchors, also called tiebacks or screw anchors, to secure affected walls to stable earth beyond the foundation. Wall plates bear upon the inside surface of the wall and may be tightened over time to move the wall back into its original position. For foundation walls that have deteriorated or even begun to cave in, FSI has developed its Shotcrete restoration system. After using anchor ties to shore up the wall, a fiber-reinforced mortar is sprayed at high pressure against the wall’s interior surface and troweled smooth. The newly stabilized wall ends up looking great and anchor plates are hidden beneath the finished mortar. For slabs and foundation walls that are subject to settlement, FSI has several products and methods available to it. A slab can be raised by boring holes through the sunken section. Piers are then driven through the holes until they reach stable soil beneath the home. Slab brackets slip over the piers and are used to support the slab as it is raised with hydraulic jacks. An alternate approach is to inject high-density polyurethane foam under the slab. As the chemical mix expands, pressure lifts the slab. Called the PolyLEVEL™ system, the slab lift is carefully monitored for level results. The foam flows into the loose soil beneath the slab to fill voids caused by soil settlement or erosion. Foundations that have settled can also be addressed with piers and brackets. Soil around the foundation is excavated to the footings. Then steel piers are driven to stable soil deep beneath the structure. Brackets are placed over the piers and under the footings. Force is applied via hydraulic jacks to lift the footings and house back into a level position. If your foundation has been earmarked for the landfill, get a second opinion. Many aging foundations can be permanently stabilized and restored using the techniques mentioned above. In addition to saving some green, you’ll be doing something green to save the planet.